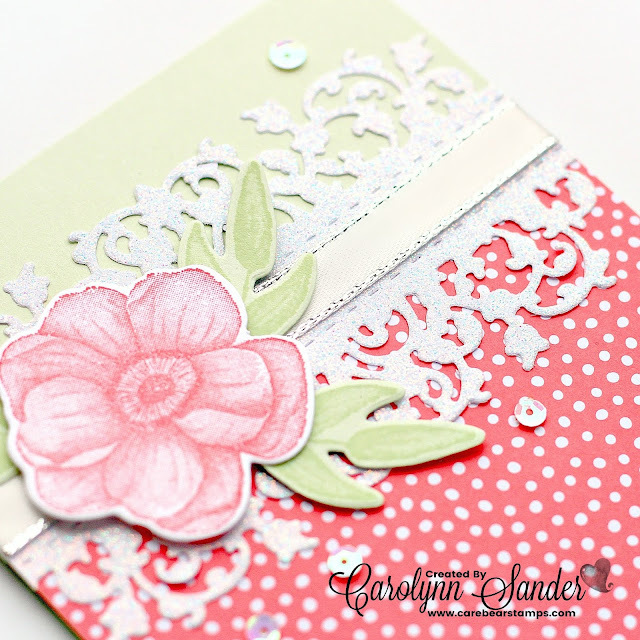 Be Inspired Design Team Blog Hop - Bling It Up! Hi everyone! 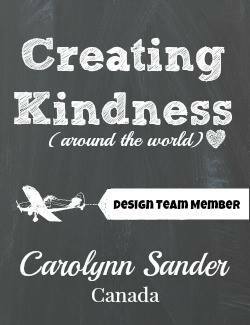 Welcome to the Be Inspired Design Team Blog Hop! 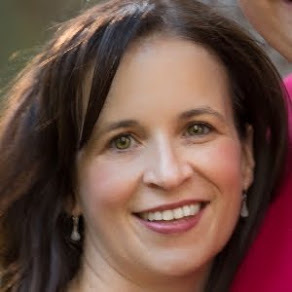 You are currently visiting Carolynn Sander in Calgary, Alberta, Canada! If you have been hopping along, you most likely arrived here via the wonderfully talented Manuela Geiswinkler! I have a feeling that she left you feeling pretty inspired today! We are honoured to have her join up with the Be Inspired Design Team! The theme for today is "Bling"! That means anything that shimmers, or shines, or dazzles! 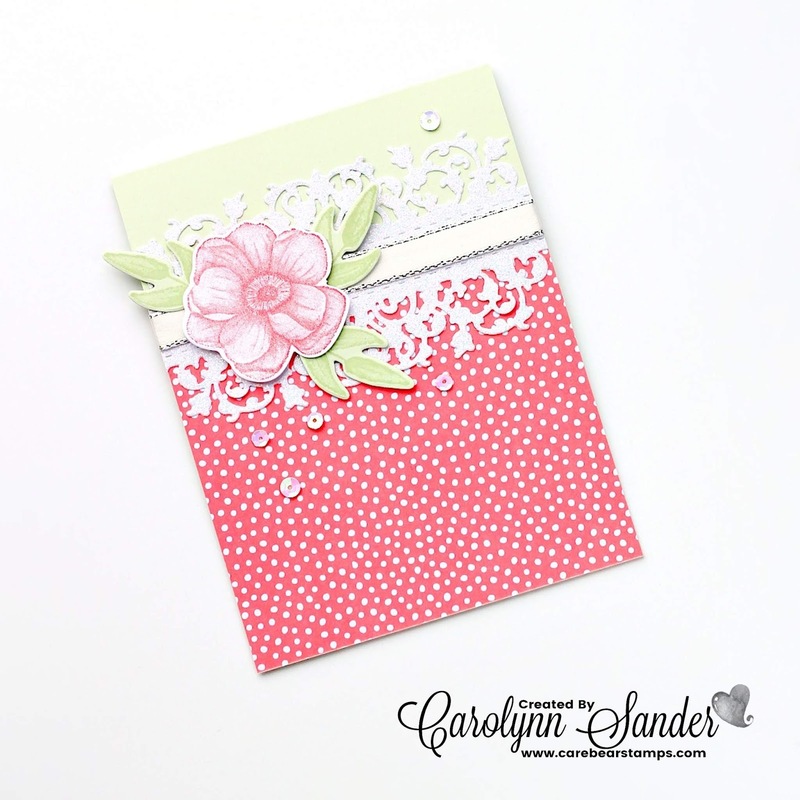 I decided to opt for some Stampin' Up! Sparkle Glimmer Paper, as well as some sequins, and some silver Metallic-Edge Ribbon to add that extra bit of bling today! What do you think? Is there enough bling? I could always add more, but I was pretty happy with the balance of bling on today's project! Stampin' Up has an array of fancy elements! The possibilities are endless! I can't wait to check out the rest of today's inspiring ideas! Up next in today's blog hop is the infamous Brian King! I can't wait to see what he has to share with us today! Thanks again! If you have any questions in regards to today's projects feel free to contact me! 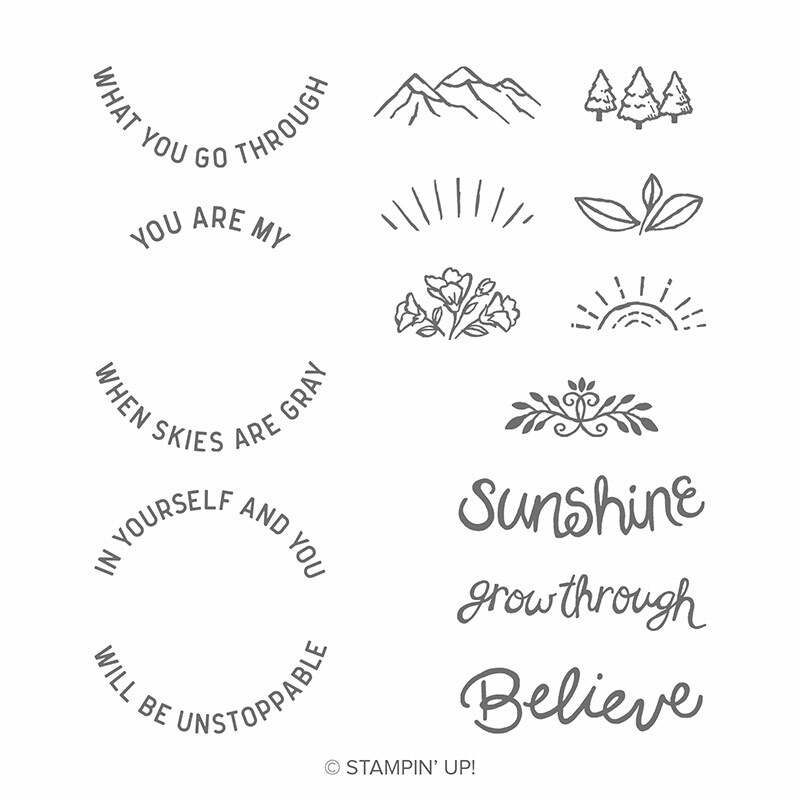 As well, if you are in Canada and you are interested in purchasing Stampin' Up! products, I would love to have you visit my Stampin' Up! online shop! Just click on the shop button below if you wish! Hi everyone! My name is Carolynn Sander. I am a Stampin' Up! Independent Demonstrator from Calgary, Alberta, Canada. 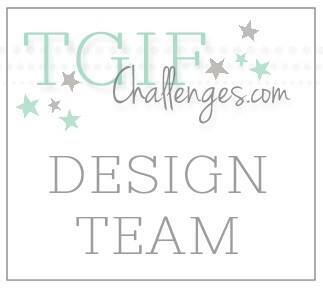 The TGIF Team is at it again with a fun challenge! 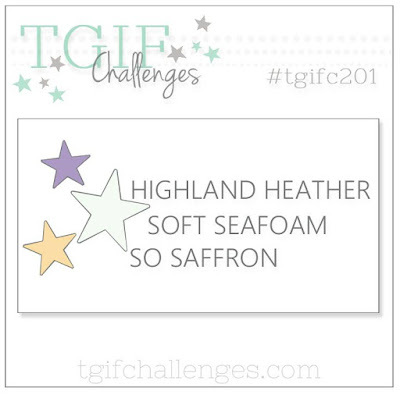 Come on over to the TGIF Challenges site and have fun creating with us! 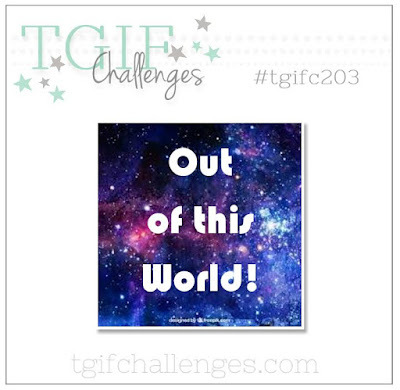 We would love to see how this week's "Out of this World" theme inspires you! When I pondered this week's theme, I imagined creating a beautiful galaxy card. I truly LOVE the galaxy background technique! You can learn how to create a galaxy background by clicking HERE. This previous post of mine includes a complete tutorial, so make sure you have a look if it interests you. Anyhow, it ended up that I really just didn't have the time this week to create that galaxy background. Life happens right? Like Every Freak'n Day! So I decided to go with the simple route! & The Stampin' Up! Memories & More cards came to my rescue! Other than a little dry embossing, and a little bow tying, today's card was literally slapped together! Now that's what I call inspiring! A card in a quickie is my kind of card these days! Thank you so much for visiting today! I hope that you leave here feeling a wee bit inspired. Remember to stop by the TGIF Challenges site to join in the fun this week! Feel free to contact me if you have any questions. As well, if you are from Canada check out my online 24/7 Stampin' Up! supply shop below! Hi everyone! My name is Carolynn Sander. I am a Stampin' Up! Independent Demonstrator from Calgary, Alberta, Canada. The TGIF Team is at it again with another inspirational colour combo! Come on over to TGIF Challenges site and have fun creating with us! We would love to see how today's soft and subtle hues inspire you! When I first studied this week's colour combo I pictured spring and Easter! I actually really can't wait until spring! The cold weather up here in the great white north gets a little depressing after a while. I decided to brighten my day by creating a flowery card with today's colours! Saying that, I have to apologize, but I really didn't see the Saffron fitting in with my project. So I decided to opt out of it! You can too if you wish! The colours are really there for inspiration! So do as you wish & let your creative juices flow! 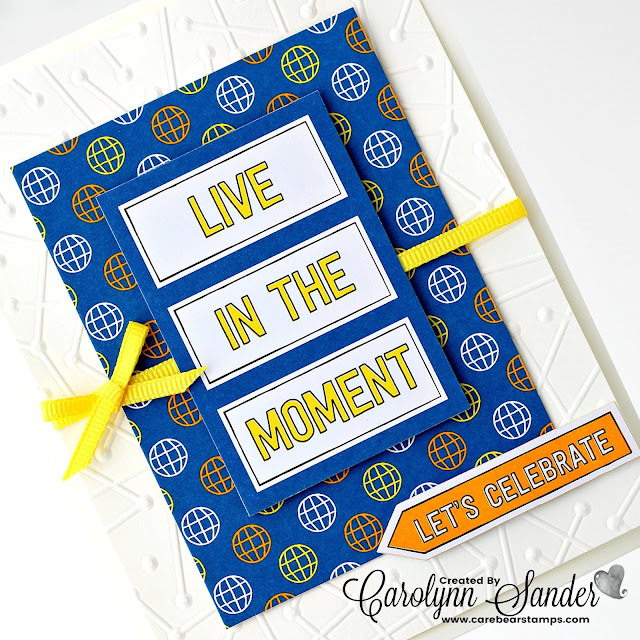 I really adore the sayings that come in the Stampin' Up! Here Comes The Sun Stamp Set! You can earn your set for free if you place a qualifying hostess order! It's definitely one of my favourite hostess sets of recent! & The best part is, it's photopolymer! Meaning you can bend and twist the stamps to reshape the sentiments to your liking, as I have done on today's project! Check out all of the images that come in this set below and you will catch my drift! What do you think? Isn't this set fabulous? If you would like to check out another card I created with it you can do so by clicking HERE. It is so versatile! I am sure you could create your own unique fabulous creations with it! Or feel free to CASE (Copy And Share Everything) mine! Sharing is caring after all!